Just four years in the business was enough for this young man - a man whose wrestling career and his life finished at the same time - to become a legend. Born in Guadalajara, Jalisco, he and his brother Plata wanted to become wrestlers to follow the family tradition. Their father, who used to work as El Calavera II, was not happy with this idea, but finally agreed to let his sons wrestle, so he taught them some basic lessons before sending them to the Arena Mexico gym where "Diablo" Velasco trained them properly. The brothers made their debut on November 23, 1990 at an Arena Mexico card, and soon they started teaming with non-relative Platino (Platinum) as the trio Los Metálicos. Basically since their debut, Los Metálicos feuded with Los Destructores (Vulcano, Tony Arce and Rocco Valente) in trios and even tag team matches, as Oro and Plata also feuded with the original Destructores tag team (Tony Arce & Vulcano) over the National Tag Team straps that they finally captured on December 4, 1991 in Acapulco, Guerrero. Six days later, the title was declared vacant after a match with a controversial finish, and a week later (December 17) Arce and Vulcano regained the vacant titles by defeating the metallic brothers. The team became popular really soon as Plata was a good flyer and so was Platino, but it was Oro's reckless aerial attack what always stole the show. His move set, spiced up with moonsault variations from any position and all kinds of planchas and topes, may not be so special nowadays, but back then it was state-of-the-art high flying. With that said, Oro wasn't your generic 90's spot-machine that blew half of the moves he tried, he had really sharp and smooth execution, knew how to build to his big moves to make them look special and he also knew how to work the mat. Those that have never seen him can get a rough idea of Oro's style comparing him to a larger Rey Misterio Jr. 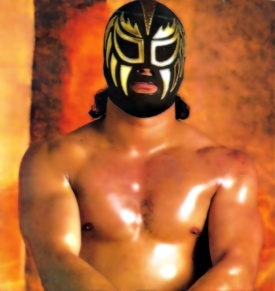 He had his Japanese debut in April, 1992 for Gran Hamada's Universal lucha libre promotion. With his spectacular flying he quickly made himself a reputation among the Japanese fans, so he returned to Japan in mid-December when he a chance to tour for the newly formed FULL promotion. His status in Japan was so big that when back in Mexico he teamed with Mil Mascaras and Ultimo Dragon, the trio was called a dream team of the best high flyers of three different decades (even though you can't really call Ultimo an 80's wrestler). In the early months of 1993 he started to get pushed as a singles performer, so Bronce (Bronze) substituted him in the Metálicos team, though he still teamed with Plata and Bronce several times. For the record, there was at least two different Bronce's, and one of them was none other than Black Warrior. Starting his singles push, he was almost immediately put into a feud with an aging but still capable worker like Mano Negra (The Black Hand) who had turned rudo just a few months earlier. On January 8, during a match, Mano Negra shook the ropes and Oro, who was standing on the top rope, fell over his shoulder and injured it. In March, with Oro still out, Negra got the NWA World Middleweight Title and two months later, on May 23, Oro took it from him. This is the only singles title Oro would win during his short but memorable career. He keep the strap around a month and a half as on July 3, Negra got it back in a match in Puebla. Many magazines hinted an upcoming mask vs. mask match between both men, however all of a sudden, Atlantis became Mano Negra's regular opponent, and the man that finally took Negra's mask in the EMLL 60th Anniversary Show. This was because even though he loved pro wrestling, Oro hated being away from his home in Guadalajara, Jalisco. He also had pressure from his family, that wanted him to retire, and he even told Canek and his brothers that he was planning to quit the business sometime around 1994. The CMLL heads knew this, so they decided to give Negra's mask to somebody whose career would benefit from it. Oro never had a big feud again but he always had a good spot in the cards based on his popularity. Nobody would have been that surprised to see Oro seriously injured, since due to his big desire to become better he was willing to do insane things like using all kind of dives outside the ring with his opponent moving so he'd crash onto the cold, hard floor. Like a Shawn Michaels or a Manami Toyota, he had a lot of pride in his work and he was upset if his match was not the best on the card or his performance was not the most awesome. He always watched the undercard matches of the shows he wrestled at, and if somebody took a huge bump or used a very spectacular dive, he'd make sure he outbumped that wrestler. He even watched all kinds of tapes from Japan and the US in order to pick up more bumps and spectacular maneuvers. However tragedy struck on October 26 during a match at Arena Coliseo, and this sure caught everybody by surprise. During a match pitting him, La Fiera and Brazo de Plata against Kahoz, Dr. Wagner Jr. and Jaque Mate. Before the match he told the other wresters that he'd take a "Kobashi bump", in reference to the head first backdrop driver fall that Kenta Kobashi from AJPW took in a match against Dr. Death Steve Williams. That bump had a really dramatic effect as it looked like Kenta had broken his neck. During the match, Kahoz clotheslined Oro who spun and landed on his head. His opponent tried to pick him up, but soon thereafter he collapsed and his pulse got low. Oro was stretchered out at the start of the second fall while his brother screaming "Don't fall asleep!" at him so he wouldn't lose consciousness, as there's a Mexican tradition that says that wrestlers can't die while conscious. That didn't even help a bit though, as Oro died before he was even put in the ambulance. The following day the news headlined every lucha newspaper or magazine and even the rival promotion AAA had a tribute to him before a Heavy Metal vs. Hijo del Santo championship match. To please the family's wishes no autopsy was performed, however everybody pointed out that he was a 100% drug free real athlete, so it's believed that he died of a brain aneurysm. This death created a scary sentiment among the fans at the shows as a few days later Vampiro collapsed after a match with Black Magic (Norman Smiley) and a lot of women started crying hysterically thinking he was dead. Oro has not been forgotten by the Mexican fans. In the past EMLL has held tag team tournaments in his memory, and every once in a while the magazines publish tributes to him. Plata changed his name to Oro II as a tribute to his brother and kept wrestling in EMLL for a few months. He later moved to AAA and wrestled as Oro Jr., but soon thereafter disappeared from the wrestling scene. The former Orito, now known as Suicida, adopted the Oro Jr. name for a while too while in Promo Azteca, but he was forced to drop the name after the family of the original Oro won a lawsuit. When thinking about Oro, everybody always ends up trying to gues what would have happened if he was still alive. If he had not quit the business now he'd probably be among the main superstars in Mexico. For such a risk taker he was a fairly big man (5'10" and nearly 200 pounds) with an impressive physique so he could have been easily seen as a threat to the stablished veteran heavyweights. And most likely he would have put on quite a few classic matches in Japan and Mexico, and who knows, maybe even the United States. But in reality nobody knows what would have happened. We only know that Oro left us too early. This page was last edited on 2 October 2014, at 13:01.